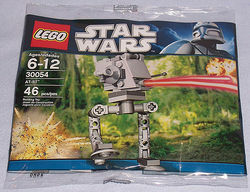 30054 AT-ST is a Mini Star Wars themed set released in 2011. The set contains 46 pieces, and when built depicts a small AT-ST. The AT-ST consists of a large cockpit, set atop two legs. The legs are made out of joint pieces set onto circular feet, and attached to a TECHNIC beam, which in turn attaches to the body of the vehicle. The main cockpit has two guns mounted outside it, one on the felt and one on the right (in addition to these there is a smaller gun set into the front of the body). A hatchway piece set on the front of the AT-ST forms it's smooth front wall. AT-STs are also known as a "chicken walker" because of its chicken-like legs, which feature backwards knees. Even though it walks like a chicken, it is a danger to both the Ewoks in Episode 6 and the Rebel Alliance in Episode 5. In Episode 5, the AT-STs worked alongside the AT-AT, or All Terrain Armored Transport, making them equally deadly to the Rebel Alliance. The set is sold in a polybag as an Easter promotional set at Target. It was also included with The Sun newspaper on May 21 2011 . The MINI AT-ST is the very similar to the walker that appears in the set 4486 Mini AT-ST & Snowspeeder, with just a few differences. This page was last edited on 15 March 2016, at 05:35.